The InLoox options provide various possibilities to edit the customer number. 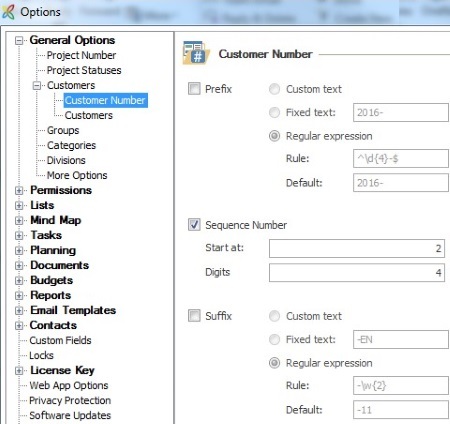 In the customer number area you also can define the rules for the number format. 2. Select General Options, click on Customers and then on Customer Number. For the number setting you need a least a prefix or a sequence number. You can combine a prefix or a suffix with a sequence number. To define the format of the customer number insert a Regular expression and a Default. Please note the format rules, for more information see: Change the number format. Adjust the customer number in InLoox 9 • Copyright 1999-2019 © InLoox, Inc. All rights reserved.